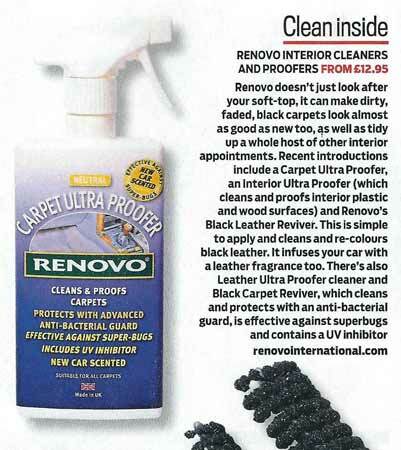 Back in the November 2010 Blue Diamond I reported on a test of the Renovo Fabric Soft Top Cleaner and promised a report on the Renovo Ultra Proofer in the next Blue Diamond. 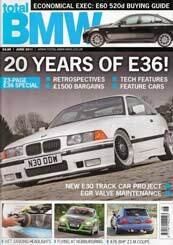 Well it is a bit a late! You may remember that I summed up the Fabric Soft Top Cleaner as a great product. I have used it three times now and have enough left for one more clean. 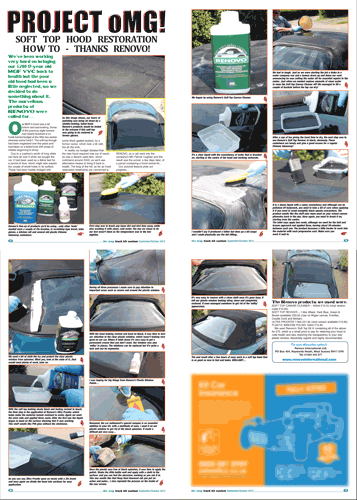 Once again the product and process was very simple and gentle on the hood. After a dry brush and vacuum and another clean the Ultra Proofer was applied with a 2" paint brush. 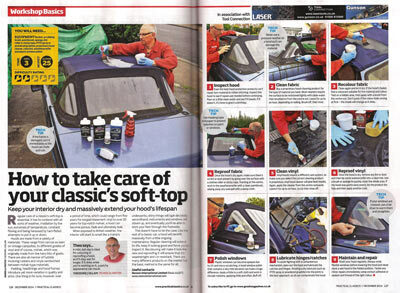 A second coat was applied as instructed once the hood was completely dry (next day). There was just enough product to get the second coat on the hood (the droppy's hood area is quite large). 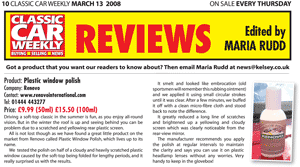 The surplus product that dripped down the glass and paintwork was easily removed with a dry cloth and left no residue following a wash. I applied the proofer just after the National Rally but I had to wait until the Orbost weekend run for the opportunity to test it. With the car left out in the open a heavy dew collected on everything during the first night. 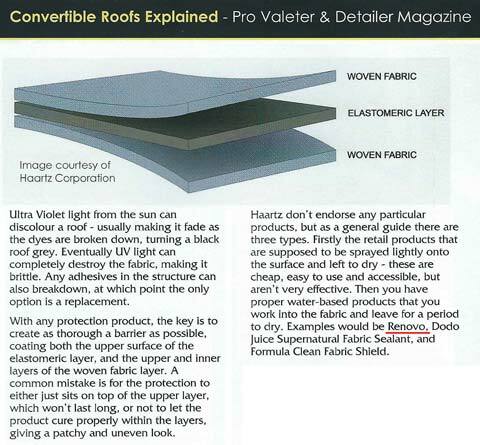 I noticed that the hood had not wetted out and the moisture sat on top of the hood in tiny droplets. It did not take anywhere near as long for the hood to dry out enough to fold down. We had a decent shower or two during the second night for a bit of intense testing and once again the hood had that dry look about it and the water beaded up. 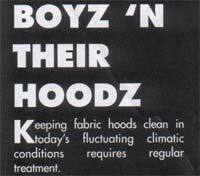 By 9.30am on a cold, dry morning the hood appeared dry enough to fold down. 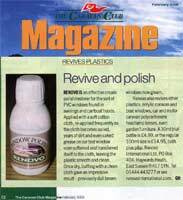 I will use the Renovo products again and recommend them to members. 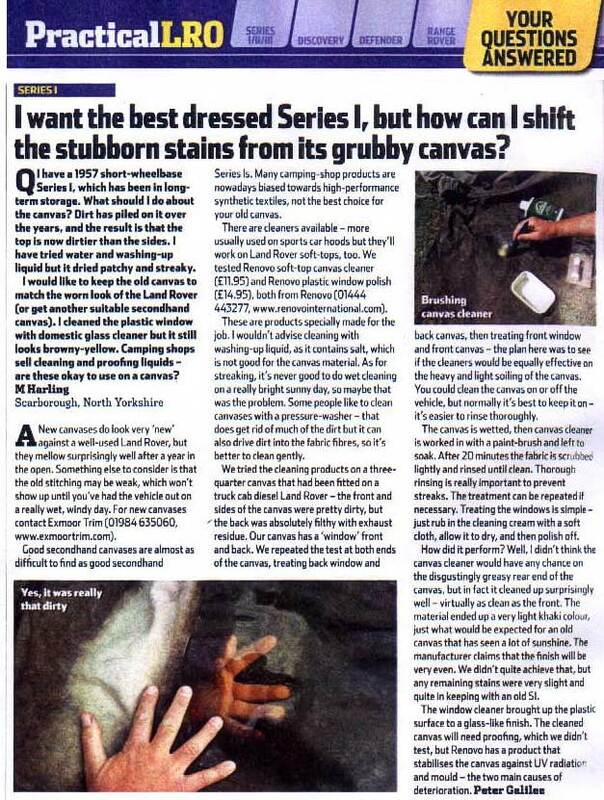 I wonder if I had used them earlier if the life and colour of the hood would have been extended. I suppose we'll find out when the time comes to replace the top. 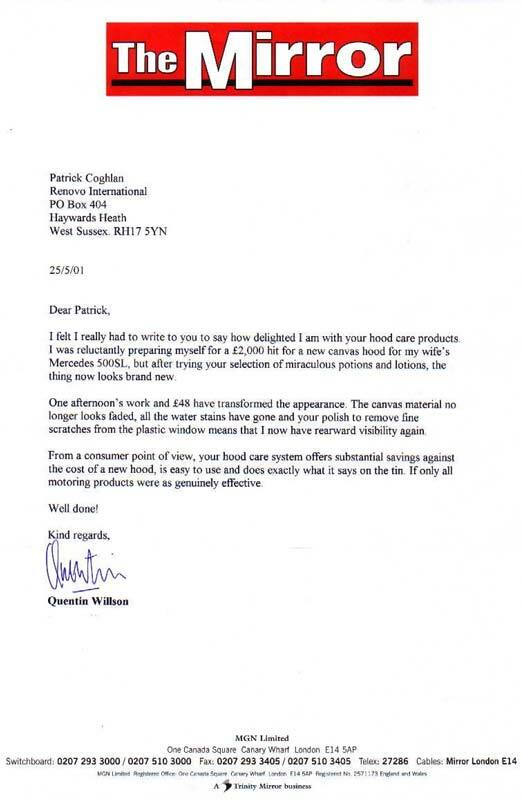 In short – again a great product. Well, my MX-5’s roof is now sparkling. The slightly unexpected chequered pattern that’s emerged appears to be inherent in the roof material – it certainly isn’t a repercussion of my far less consistent brushwork. 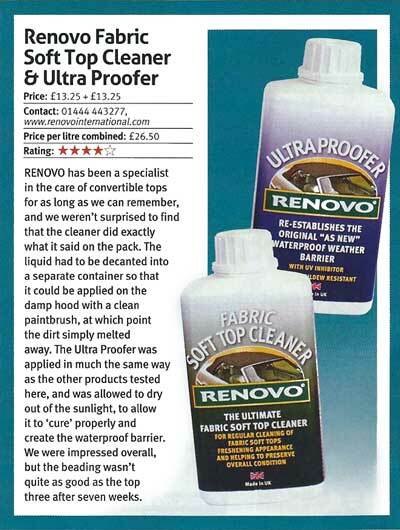 The Renovo kit is, as far as I can see, about as close as you can get to a new roof without fitting one. 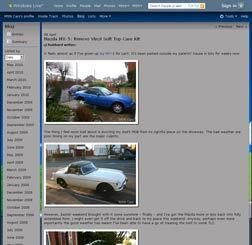 Ahead of the Show Season, I have also revived the lacklustre appearance of the convertible hood. 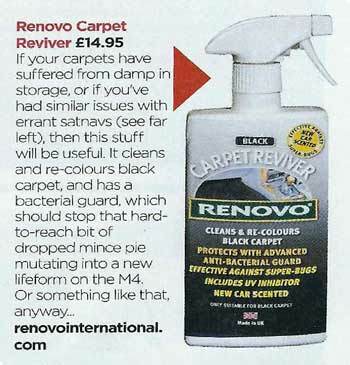 To bring it back to former glory, I turned to the highly recommended range of products from Renovo International (available directly or fromMX-5 specialists). 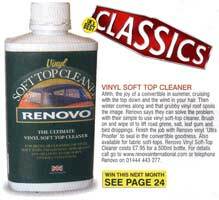 £26.50 buys you a Vinyl Soft Top Kit that comprises of a Vinyl Soft Top Cleaner, that is a simple brush-on leave, agitate and rinse process to remove the dirt from the grain of the roof. A coating of Vinyl Ultra Proofer then seals the cleaned surface and restores a glossy, water-repellent finish to the hood. Hopefully you can see the before and after in the photo- the hood now looks as good as the day it rolled out of the dealership into the Japanese traffic. 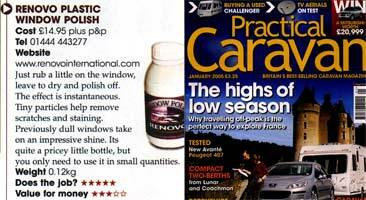 A treatment of the rear window with Renovo Window Polish has improved rearward visibility from the driver's seat too. THEY ARE SUPERB PRODUCTS, and as the Mazda's roof is pretty tiny, there is plenty of the products left for future treatments. Cleaning the plastic hood of a baby buggy. 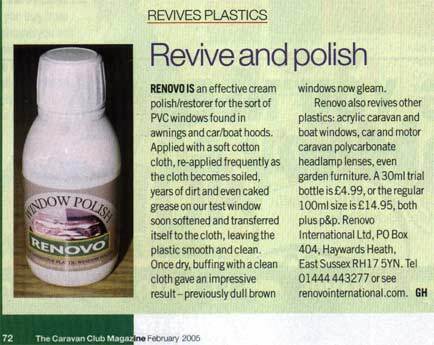 I found it (Renovo Plastic Window Polish) produced results far better than anything I had concocted at home. The result is that now I have a very clear view out again. The Reviver takes two hours to dry and the result has the appearance of a brand-new roof. Overall the results are excellent. 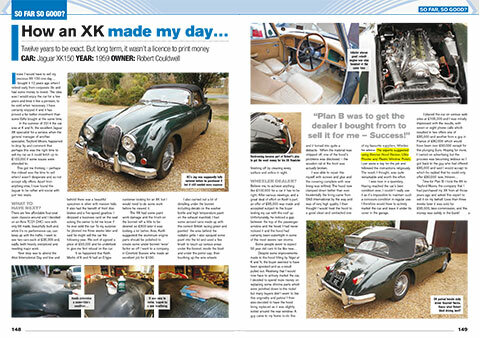 Another job worth doing for E-Type Day was renovating the double-duck hood with Renovo's new restoration kit..... 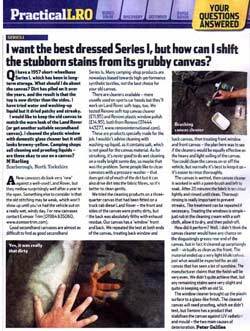 It's easy to apply and, although it took two coats of dye to cover the faded patches, the result was a vast improvement on the scruffy original. Comme vous le voyez, après l'épisode du nettoyage au savon, qui si cela avait marché, aurait été la vraie bonne nouvelle, il a fallu se tourner vers des produits plus efficaces. - Comme le produit m'avait été prêté, je n'ai pas forcé sur la dose, qui selon RENOVO doit être 2 fois supérieure. - C'est le produit préventif, et non curatif qui a été utilisé. Par conséquent, je vais foncer chez un distributeur RENOVO pour acheter un kit complet (curatif, préventif et lunette), qui me permettra de restaurer et entretenir trimestriellement cette satanée toile cirée qui me sert de capote. Je suis persuadé que sur une capote moins attaquée que la mienne cela se passera bien. Attention, je ne fais pas de propagande, et je ne gagne rien dans l'affaire. Je sais, de part mes recherches, que des distributeurs proposent des produits du même style, et cela vaudra probablement la peine de l'essayer. Cloth hoods add a touch of class to open cars, but over a period they tend to fade and look shabby. 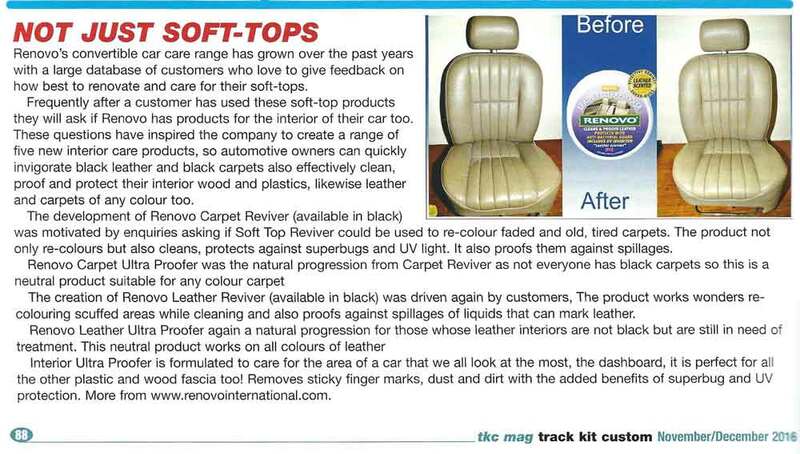 Now they can be given a new lease of life and returned to their original colour with RENOVO Hood Reviver. 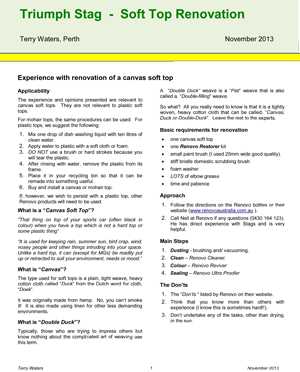 It can be used on canvas, double duck or mohair hoods, but is not suitable for vinyl. 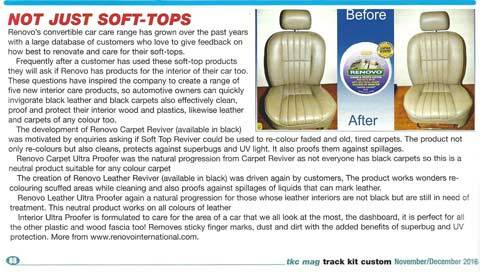 We tried our Hood Reviver on a badly faded 30 year old canvas hood and found that two applications were necessary to complete the coverage. 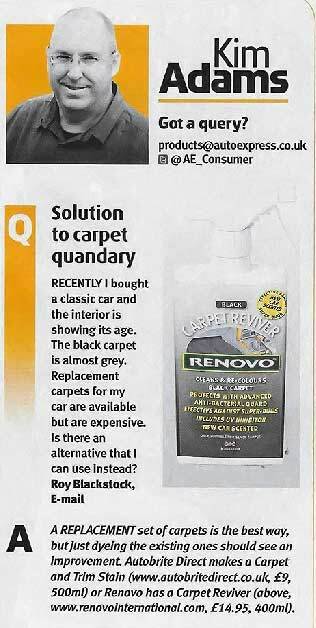 One litre would seem to be sufficient for two coats on most four -seater tourers. It makes a hood look new again. 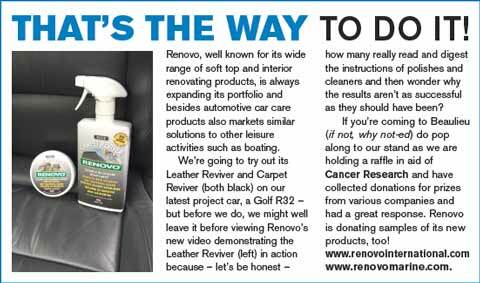 RENOVO have come up with some excellent products for those of us pestered with dirty and grubby convertible hoods. 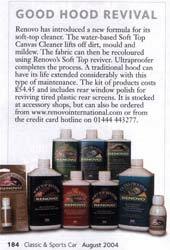 First there's Hood Reviver for double duck, canvas or mohair soft tops. 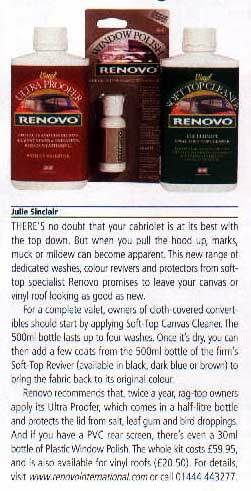 It helps renovate discoloured and faded hoods and comes in either black, dark blue or brown for a simple brush on or sponge application. It dries quickly and within an hour a second coat can be applied to bring up the lustre of the original hood condition. 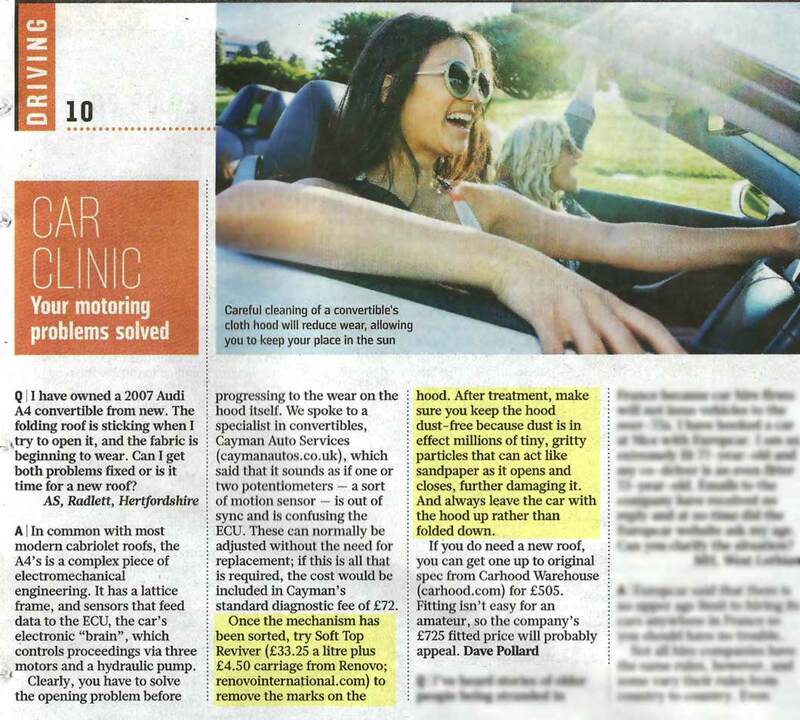 Then there's Plastic Window Cleaner to offset some of the problems normally associated with this type of window in convertibles. As the hood folds down scratches occur from microscopic canvas friction marks. With the new cleaner these marks can be polished out, which can also reduce significantly the cloudiness that is also common with this type of rear screen. 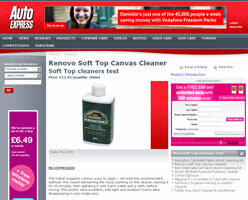 This is not a miracle cleaner so it does not work on screens that are so severely scratched that you can't see out of them, but as the photos show, it can work very well if applied correctly and carefully. 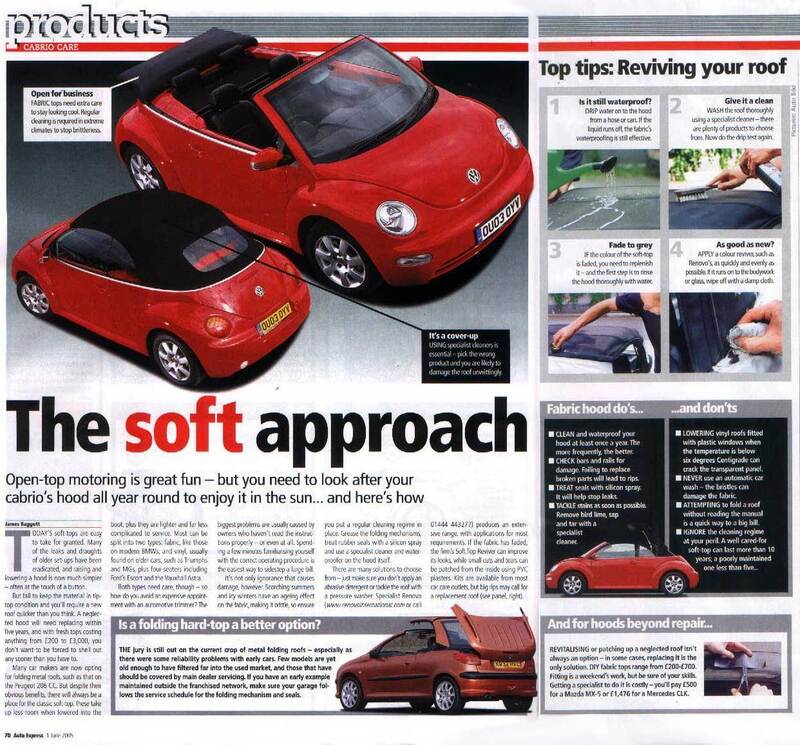 If YOUR convertible hood looks a bit tired, there's no need to buy a new one. 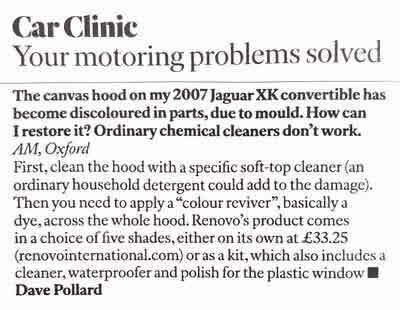 For £48 I got a kit of hood reviver, proofer, dry cleaner and even a polish to remove scratches and cloudiness from the plastic back window. An afternoon's work and the hood on my Merc SL now looks brand new. Just as well, since a new one is two-grand territory. 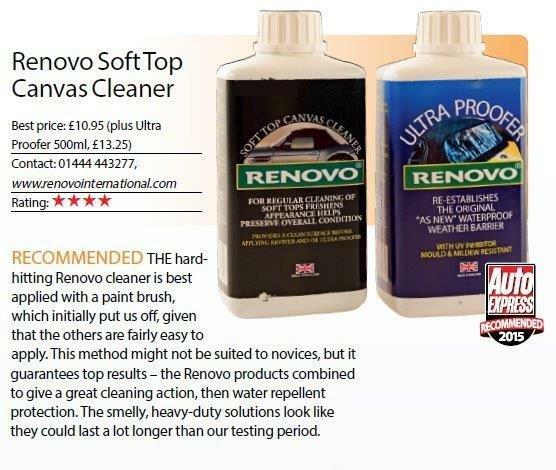 Designed to be applied after the Renovo Reviver to restore the water-proof barrier and repel stains. As with the dye it is brushed on and allowed to cry and again it worked well. 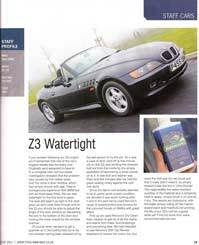 When hosed down it repelled water strongly initially and did so for longer than its rivals. It's the first time we've tested Renovo's products and they performed well. 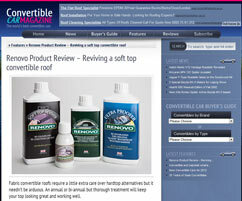 If your roof has the specific problems the Reviver and Ultra Proofer deal with, give them a try. The end result is quite outstanding! You can't see any residue on the surface, the colour is completely even and if in the long-term durability is as good as they claim (no cracking and a special sealer prevents fading) then this is one product which is worthy of its advertising (and believe me for cynical advertising man to say that; it has to be good!). Our Quantum 2+2 was needed on display at the Chatham Show, and the only part of the car that did not look good as new was the hood. 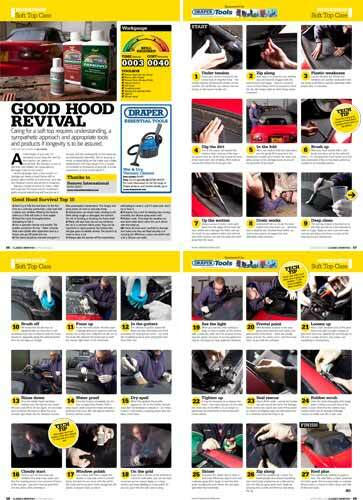 For appearances sake we decided to treat it with Hood Reviver. It was a simple enough task. 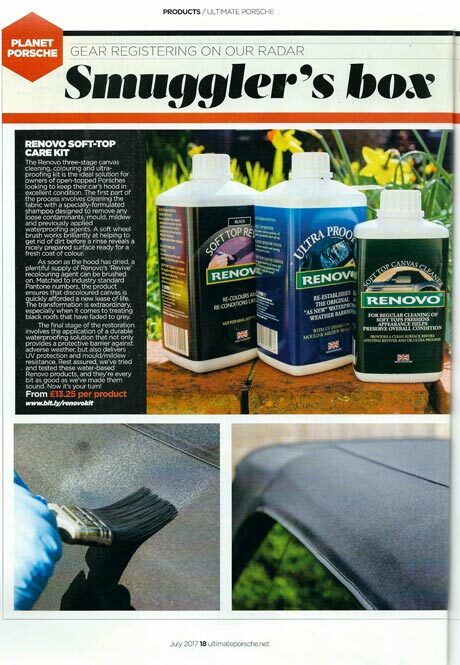 We chose a warm spring day and started by brushing the hood with a stiff clothes brush to remove any dust, then simply painted on the Hood Reviver with a two inch brush. After removing the masking tape we stood back to admire the results. The car looked great with a hood as good as new and all ready for the Chatham Show. 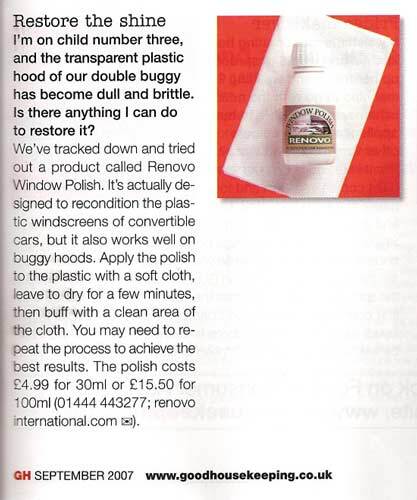 The packaging says "The definitive Plastic Window Polish". Oh yeah? 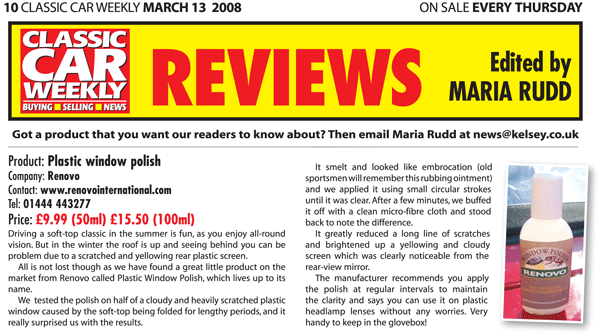 Well actually, if not THE definitive polish (I struggle to award 10 out of 10, it's pretty darned close to it ....probably 9.5 out of 10. 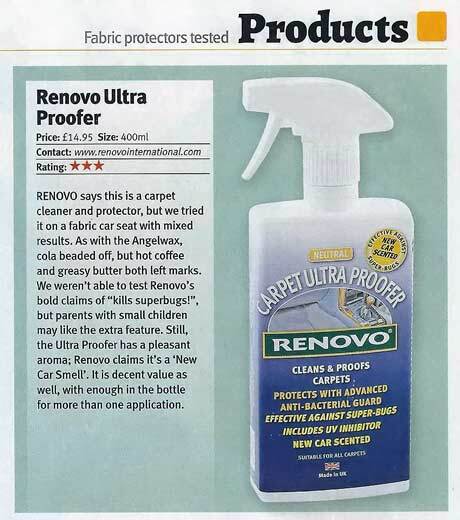 It's quite rare that I test a product that's as good as it boasts, especially when, like RENOVO's, those boasts are plastered all over the bottle. 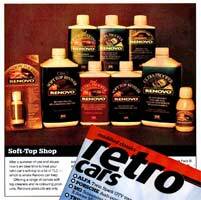 But, bless me, RENOVO works. 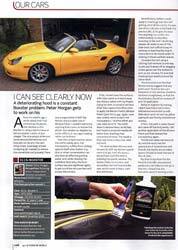 Not only does it remove scratches from perspex and plastic rear hood windows, it's easy to do. They keep you inside in the dry, yet you can still see out through the clear plastic panels. Until the plastic becomes scratched by the continuous folding up and down of the wood, and ultra-violet rays make the panels go cloudly. 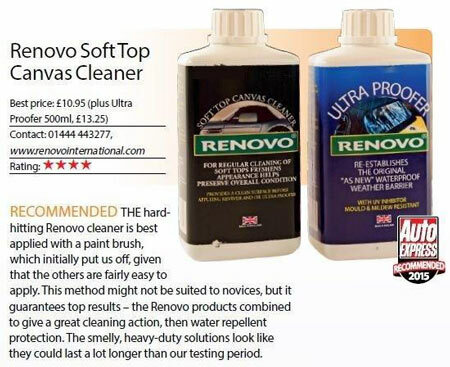 This new product from Renovo aims to put that right by removing cloudiness and scratches, using a simple polish-on, polish-off process. I tried the stuff on the corner sections of my wheelhouse windows, which are curved and, therefore, perspex and which were very cloudy. 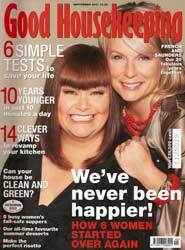 I admit I was sceptical. After all, the perspex is 3/16in (8mm) thick and much tougher than the flexible panels one finds in a hood. However, I've gone over them twice and there is a dramatic improvement - I reckon a third dose will restore them to close to their original clarity. 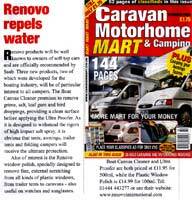 At the price it's a lot cheaper and easier than new windows or hood. 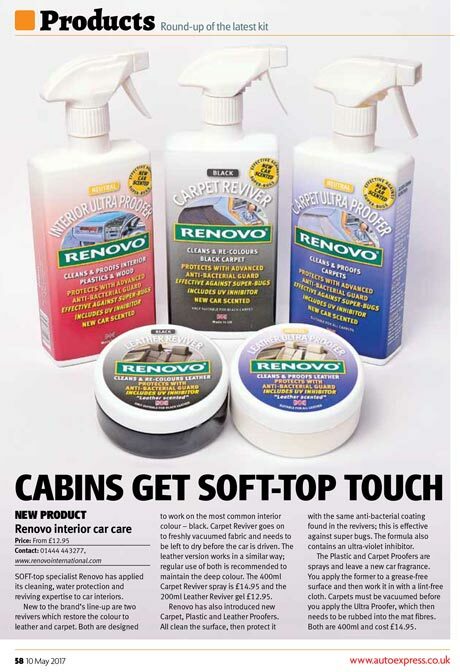 Renovo's Plastic Window Polish is now beginning to establish itself as an aviation product for cleaning and polishing perspex cockpit canopies and windshields. As soon as you start to use a light aeroplane the windshield quickly loses some of the wonderful clarity it had when new. Once it has been dusted a few times, washed down, and suffered being taken off through someone elses dusty slipstream or flown through a batter of hail, it soon begins to show signs of damage in the form of microscopic scratches. These have their worst effect landing into a low sun and makes it virtually impossible to see anything straight ahead. 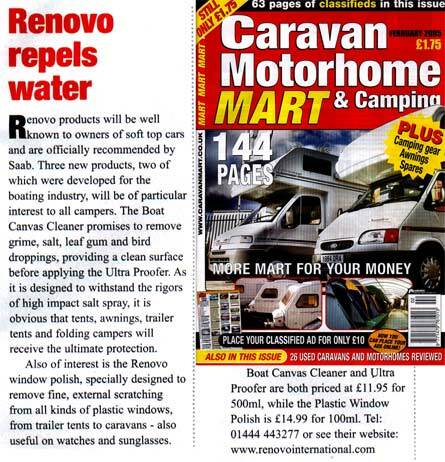 There are many products on the market to polish plastics but not all are ideal for aeroplane canopies. 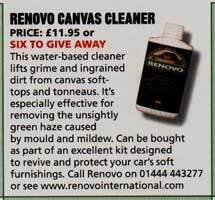 Renovo Window Polish, to judge from the testing I have done, fills the bill pretty well. 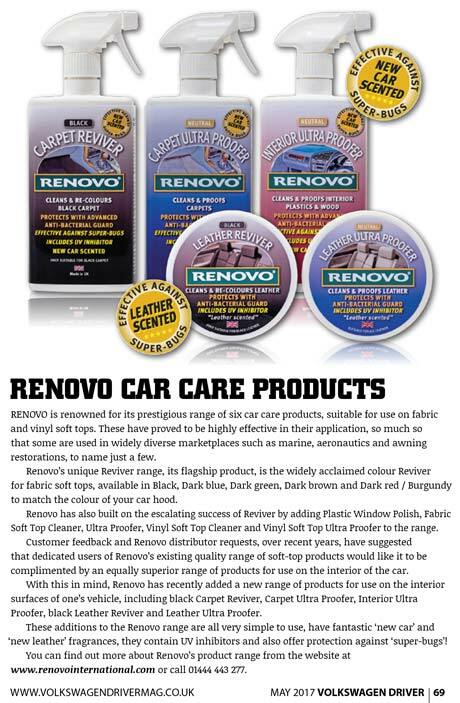 I've used it on a well-worn, 25 year old windshield of a Gruman AA-5 and I could easily see just what a distinct improvement the Renovo polish made to pilot vision, 'healing' many of the hairline scratches. 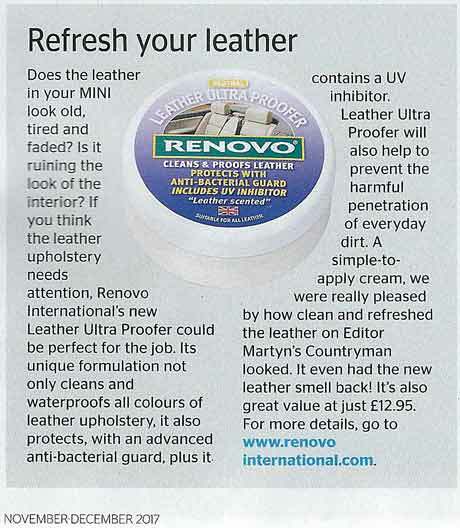 The result is quite amazing; it isn't 'as new' but it is very much the better for its treatment. 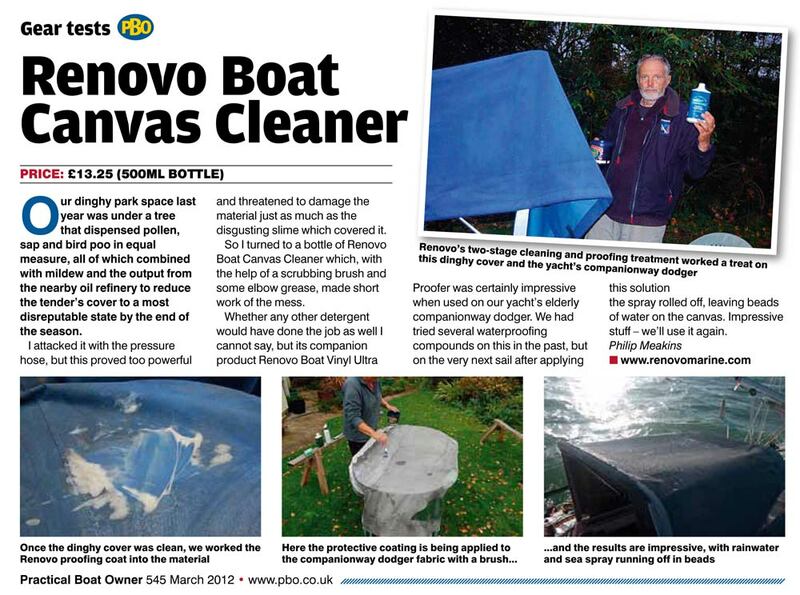 If you are one of those pilots who use a waterproof cover to protect their aeroplanes, you might well be interested in a few other Renovo products. 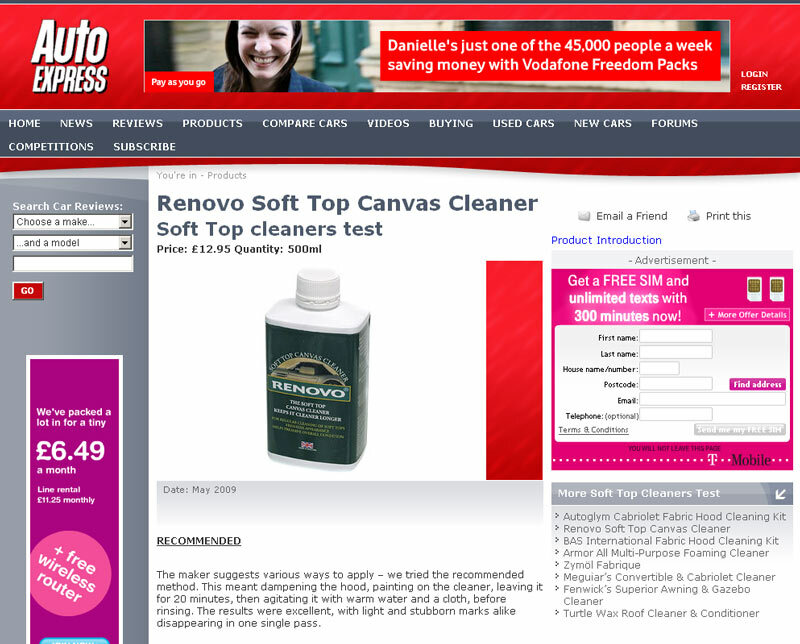 These include a Cleaner that shifts bird-droppings, salt, leaf-gum, and general gunge from the aircraft cover with ease and without harming its waterproofing; an Ultra Proofer that reproofs the cover and contains an ultra-violet inhibitor and resists mould and mildew; and a Colour Reviver to smarten up the appearance of your parked machine.